Whether you are a chef, studying to be a chef in the future, or if you are just curious about different cuts of meat from the grocery store, it is always smart to know what cuts of meat come from what part of the animal. Beef rib steak is a cut of meat from a cow or steer. It is cut from the rib section of the animal. It has different names from different sections of the ribs, and is sometimes called prime rib, although it is not qualified as prime by federal standards. There are many ways to prepare the variety of cuts, and these are great for a main course or used in smaller pieces for snacks or appetizers. A beef rib steak has a couple of different varieties, depending on what part of the ribs they are from. The back ribs are best known as barbecue beef ribs. They are not particularly meaty but are long and are a favorite past times of barbeques and family events. A rib-eye steak is very popular throughout society. These are the most tender of these cuts and are boneless, but also the most expensive. A rib-eye roast can be cut into rib-eye steaks and are very fatty. A rib roast is usually a rack of ribs cut into different smaller sections. These are full of flavor because they are meaty, fatty and cooked with the bones. The next part of this rib roast is the smaller end of it, which is more known as a sirloin tip, where it is more tender and lean. A rib steak is different from a rib-eye steak because they are more fatty with more bone present. Each of these meat cuts from the beef rib steak has different characteristics. The rib meat is well-marbled and fatty, to make it juicy and flavorful. The steak parts, such as the rib-eye steak, are tender to the touch, well-marbled and usually boneless. The beef rib roasts are very juicy, but tougher because they are thicker portions of meat (but when cooked with the bones they are more flavorful). 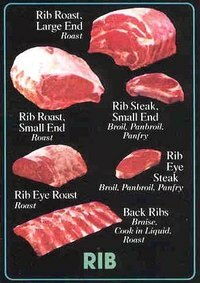 All of these cuts show lines of white fat through the white and brown meat portions. The bone areas are very white because of preservation and refrigeration. Pressing into them with a finger, they provide a soft give that will still be that way when they are cooked medium rare. These cuts of meat are not the most healthy for you, since they contain more fat than other cuts from a cow or steer. They do provide substantial protein, though. If you cook them less than well-done, you risk illness from undercooked meats. However, these meats taste best medium to medium rare because of the juiciness of the tender red meat on the inside. Trim the steaks closely to get rid of more fat during preparation and cooking. It's best not to marinate rib cuts, but the steaks benefit from being marinated in certain herbs, oils and sauces. For the rib slabs, grill them whole and cut only upon serving. Marinate the steaks in ingredients such as onion, red wine, soy sauce, shallots, garlic, whiskey, bourbon, pepper, ginger and salt. Beef rib steak and meat cuts are best broiled or grilled, cooked over medium heat evenly on both sides to keep its rich and tender flavor and juiciness. Complement the beef rib steak and other cuts with vegetables that are grilled alongside them, such as corn on the cob, green beans or peppers. Beef rib steak, rib roasts, rib-eye steaks, rib steaks and ribs can all be stored in the refrigerator for three to four days and in the freezer for 6 to 12 months. Do not thaw at any time unless you are going to prepare and cook the steaks. When cooking, they can take anywhere from 10 minutes (for steaks) to 4 hours (for roasts). It really all depends on how you want the meat prepared and cooked. After being cooked, the steaks can keep up to a couple of days as leftovers, but do not try to re-freeze them.